To acquire these files you will need to double-click on the archive file to download to your hard drive. These downloads may contains PDF files which require Adobe Acrobat Reader to view. Chapter 1 : Ten Principles of Economics. Chapter 2 : Thinking Like an Economist. Chapter 3 : Interdependence and the Gains from Trade. Part 2: SUPPLY AND DEMAND I: HOW MARKETS WORK. Chapter 4 : The Market Forces of Supply and Demand. Chapter 5 : Elasticity and Its Application. Chapter 6 : Supply, Demand, and Government Policies. Part 3: SUPPLY AND DEMAND II: MARKETS AND WELFARE. Chapter 7 : Consumers, Producers, and the Efficiency of Markets. Chapter 8 : Application: The Costs of Taxation. Chapter 9 : Application: International Trade. Part 4: THE ECONOMICS OF PUBLIC SECTOR. Chapter 11 : Public Goods and Common Resources. Chapter 12 : The Design of the Tax System. Part 5: FIRM BEHAVIOR AND THE ORGANIZATION OF INDUSTRY. Chapter 13 : The Costs of Production. Chapter 14 : Firms in Competitive Markets. Chapter 16 : Monopolistic Competition. Chapter 17 : Oligopoly. Part 6: THE ECONOMICS OF LABOR MARKETS. Chapter 18 : The Markets for the Factors of Production. Chapter 19 : Earnings and Discrimination. Chapter 20 : Income Inequality and Poverty. Part 7: TOPICS FOR FURTHER STUDY. Chapter 21 : The Theory of Consumer Choice. Chapter 22 : Frontiers in Microeconomics. Part 8: THE DATA OF MACROECONOMICS. Chapter 23 : Measuring a Nation’s Income. Chapter 24 : Measuring the Cost of Living. Part 9: THE REAL ECONOMY IN THE LONG RUN. Chapter 25 : Production and Growth. Chapter 26 : Saving, Investment, and the Financial System. Chapter 27 : The Basic Tools of Finance. Chapter 28 : Unemployment and Its Natural Rate. Part 10: MONEY AND PRICES IN THE LONG RUN. Chapter 29 : The Monetary System. Chapter 30 : Money Growth and Inflation. Part 11: THE MACROECONOMICS OF OPEN ECONOMIES. 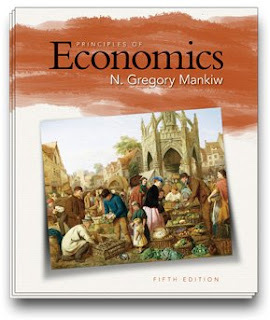 Chapter 31 : Open-Economy Macroeconomics: Basic Concepts. Chapter 32 : A Macroeconomic Theory of the Open Economy. Part 12: SHORT-RUN ECONOMIC FLUCTUATIONS. Chapter 33 : Aggregate Demand and Aggregate Supply. Chapter 34 : The Influence of Monetary and Fiscal Policy on Aggregate Demand. Chapter 35 : The Short-Run Tradeoff between Inflation and Unemployment. Chapter 36 : Five Debates over Macroeconomic Policy. Yangki Suara, a PhD student in Development Studies with Reference to Emerging Economies at King's College London.